Deborah Reynolds, Vancouver, Canada | About Face Image Consulting, Inc. The Now to WOW Diva! In order to be one step ahead, you have to do more than just what everyone else is doing. Is there something that makes you stand out in the crowd, as an exceptional businessperson? What would make someone want to do business with you, as opposed to your competitors? 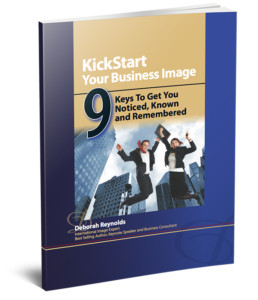 Now that you have discovered the 9 Keys, sign up for my mailing list to download the full 32 page KickStart Report, and get access to my Maximum Impact Newsletter and articles. Change, Renew, Empower and Transform! We'll Get You Noticed, Known and Remembered™ ... for all the right reasons! Along with Dr. Wayne Dyer and Anthony Robbins, of "Living In Clarity"
Getting You Noticed, Known and Remembered!